Lubricant Packaging Market size was more than USD 11 billion in 2016 and will witness 3.5% CAGR during the projected timespan. The raw material used in the industry are petrochemical derivatives. Thus, fluctuating petrochemical feedstock prices is a major challenge for lubricant packaging market size growth in the coming years. 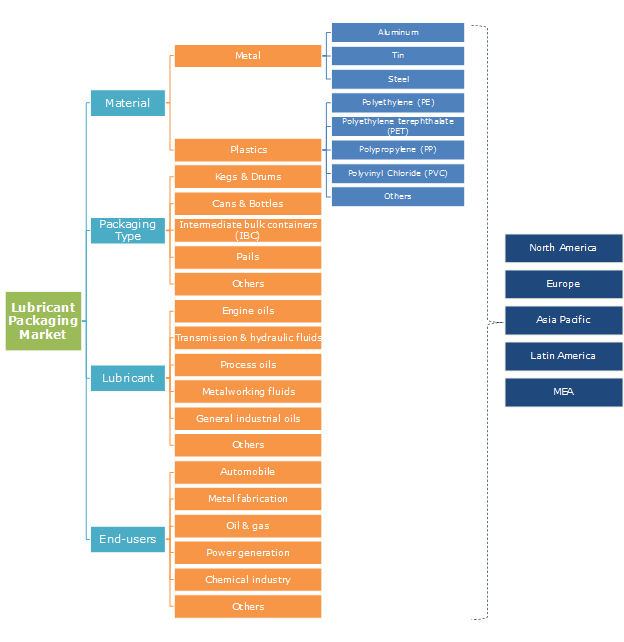 Other major hurdle for lubricant packaging market growth is the environmental pollution caused by plastic packaging formats.Increasing automobile sales in BRICS nations and steadily growing power generation sector shall play a key role in fueling lubricant packaging market size in the coming years. This is chiefly attributed to the fact that the aforementioned industries comprise of compressors, turbines, electrostatic rotors, engines, and various other mechanical components that require lubricants periodically for smooth and uninterrupted functioning. Rapid industrialization in Latin America and Asia Pacific, especially in China and India is a prime factor responsible for metal fabrication and chemical industry growth in recent times and shall further positively influence lubricant packaging market growth over the forecast timeframe. Plastic led the overall lubricant packaging market in 2016 and accounted for more than half of the total industry share. Plastics are widely used in many end-user industries for packaging, as these are cost-effective and have high strength and pressure resistance. Cans & bottles, drums and pails are generally made of high density polyethylene, polystyrene and polyethylene terephthalate. Plastic is likely to hold the same position in lubricants packaging market by 2024, as it is lightweight, durable and can be manufactured in varied shapes and sizes according to consumer demands. Automobile industry is the biggest end-user of plastic based packaging containers for lubricants handling and storage. Metal accounted for a minimal share in lubricant packaging market size. However, conventional kegs & drums are made up of metal. 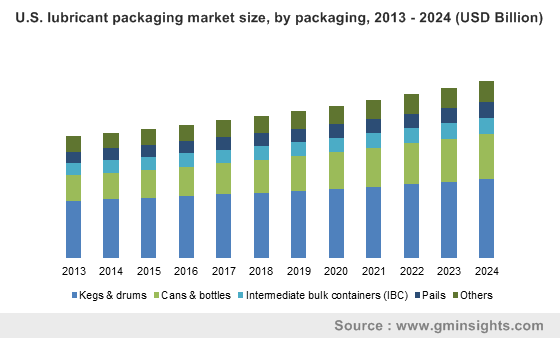 Cans & bottles held the largest share in lubricants packaging market in 2016 and will witness prominent growth rate over the forecast timeframe. Cans, as they are mostly made from aluminum, are easy to recycle and save money on disposal cost. Plastic bottles can now be recycled into polyester fleece or carpeting. Other aspects that contribute to its wide usage and projected growth during forecast period are durability, strength, user-friendly ergonomics and ease of storage and handling. Kegs & drums shall grow at a CAGR close to 3% in the next few years. These save warehouse space as they are stackable and can be put outside warehouse if they are made from plastic, owing to its ability to avoid rusting. Engine oil led the global lubricant packaging market in 2016 and shall grow at a CAGR of close to 3.5% over the forecast timeframe. Engine oil acts as a lubricant for combustion engines in cars, trucks, generators and lawnmowers. The increase of the automobile service industry has been a major driver fueling the demand for the automotive engine oil. Engine oil has been a specification-driven business. The packaging of automotive oil and other liquids has been as important as the oils themselves in the recent years. Product manufacturers will be leaping for packaging distinction over next few years, which in turn will drive the lubricant packaging market size. Process oil is another major important segment that shall witness maximum gains in the forecast period, expanding at a CAGR close to 4%. Process oils will witness significant demand from the rising automobile sector for their unique properties such as low volatility, high saturation, purity and stability. Rise in demand for process oils will augment the lubricant packaging industry over the forecast period. Automobile led the global lubricant packaging market in 2016 and is poised to grow at a CAGR of over 3.5% over the forecast timespan. Global motor vehicles production surpassed 96 million units in 2016 and will witness enormous growth in the coming years. Growing automobile demand shall propel lubricants market size in the near future. Lubricants are used for reducing friction and prevent wear & tear of automobile engine components such as connecting rods, shaft and piston. Rapid industrialization in developing as well as developed countries will further complement the industry growth which in turn would have a positive outlook for the lubricant packaging industry. Power generation is another important lubricant packaging end-user segment that has tremendous growth opportunities in the coming years. Due to higher levels of economic growth and improvements in the quality of life, the developing nations will likely witness a rapid increase in power demand in the forecast duration. Lubricants are an essential part of power & energy production industry as heavy equipment and machinery is involved in on a large scale. In 2016, Asia Pacific led the overall lubricant packaging market size, in terms value and volume. Asia Pacific is poised to witness tremendous growth during forecast timespan due to steadily increasing demand from mining, machining, metal forming and plastics industry mainly in India and China. Robust industrialization in the region, features a positive outlook for the lubricant packaging market. Online retailing of consumer lubricants is another evolving trend which is most visible in China with established portals such as JD.com and Alibaba. Established and continuously evolving automobile industry with rapid technological changes in North America will have a positive influence on the regional lubricant packaging market. Total automotive sales in the North America including: U.S. and Canada were over 20 million units in 2016, which will have a substantial growth by 2024 and subsequently accelerating lubricant packaging demand over the forecast period. Global lubricant packaging market share is consolidated with major players accounting more than half of the business share in 2016. Key players in the business are Greif, Mauser, SCHÜTZ, BWAY, Time Technoplast, Balmer & Lawrie, Scholle IPN, Glenroy, Mold Tek Packaging and NYE Lubricants. The lubricant packaging market is highly competitive as it has players which have multinational presence with an extensive distribution network and similarly players functional in local markets. Companies operating in lubricant packaging market have diverse kinds of business models. Some focus on sustainable packaging while some adopt aggressive market penetration policies. Emerging market players are constantly working on enhancing their product offering through introducing new packaging formats such as stand-up pouches. For instance, BAM Packaging offers stand-up pouches for packaging of motor oil and lubricants as they are recyclable, reusable, and incur low material cost & low packaging waste taxes. Lubricant packaging includes all the various packaging formats which are used in storage, handling and transportation of lubricants such as engine oils, process oils and other general-purpose oils. Lubricants are used in almost all major heavy-duty industries including metal fabrication, automobile, power generation, oil & gas, etc. Its packaging depends on the product type and the industry it serves. Lubricant packaging is of a specific type as per its handling and transportation requirements. Technologies are under development to increase the pace of filling and packaging of the product.